How do you shop for a suit? Do you go to your local Macy’s, Barney’s, Niemann Marcus, or maybe Men’s Wearhouse? 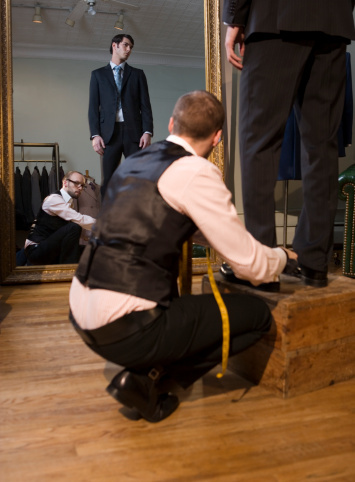 Do you like to get in, get personal help from your sales individual, and purchase everything at once, such as the pants, coat, tie, shirt, shoes, socks…you get the point; or do you like to go from store to store and build the suit yourself with your own ideas and style? You see, there are mainly two ways to buy your suit – one stop shop, or do a little more “shopping” around to find your individual style and piece it together yourself. I prefer the former because I like getting it done all at once with the help of a sales associate. Constructing your investment portfolio is very similar. Think of CLS Investments as a tailor, which makes suits, ties, shirts, etc. and you can purchase the complete ensemble all at once, or combine them with other brands to get your complete suit. CLS’s portfolios can be used in a very similar way with clients. For example, using a CLS Risk Budgeted Portfolio can be your one stop shop for a complete portfolio (suit). We globally diversify them according to the risk tolerance and they contain ETFs of equities, bonds, alternatives, real assets, etc. But maybe you’re the type of advisor or client that wants a little more variety or to put your own spin on the investments. CLS can help there also. Our recently launched Active Strategies are meant to be used as a part of an overall diversified portfolio (or part of a suit). Use a CLS Real or Alternative, or any other in conjunction with other managers or investment vehicles to put your own diversified/balanced portfolio together, much like using a Calvin Klein shirt with a Tommy Hilfiger tie and an Armani suit. You still get your entire wardrobe together in the end, just a different way to get there. No matter what type of advisor or client you are, chances are that CLS can help and our expert sales professionals are always available for a free “suit” consultation. With CLS you’ll like the way your portfolio looks. Fixed Income is an investment style designed to return income on a periodic basis. Generally, fixed income strategies invest in bonds, real estate, loans, and other types of debt instruments. Diversifiable risks associated with fixed income investing include, but are not limited to, opportunity risk, credit risk, reinvestment risk, and call risk. Alternative investing refers to the practice of investing in non-traditional asset classes such as managed futures, real estate, commodities, derivatives, etc. Diversifiable risks will heavily depend on the specific investment and may include, but are not limited to, business risk, liquidity risk, and capital risk. CLS active strategies are tactical asset allocation strategies designed to overweight a particular asset class. Since these strategies do not maintain a consistent risk level over time and can quickly become more aggressive or more conservative, these strategies are designed to be a part of, or supplement to, and not a substitute for, an overall well-diversified investment portfolio.